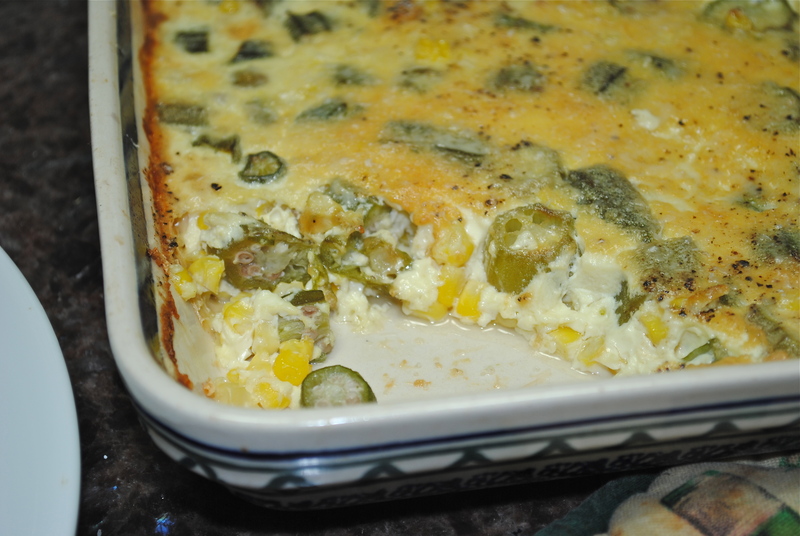 Thank your Lee Brothers for this recipe. We lived in Ft. Madison, Iowa for 6 years and surrounded by corn fields. 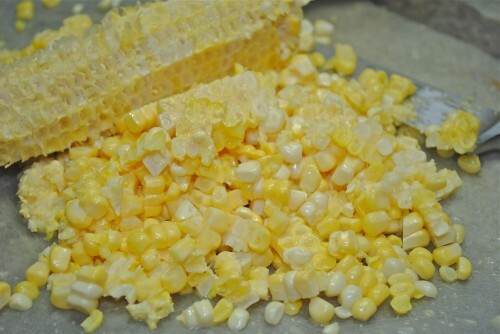 Kids (not mine, they were too young) would get summer jobs detasseling corn, and we would enjoy corn festivals in nearby towns at harvest time where you could eat yourself sick with fresh buttered corn on a stick. What I loved about living in small towns in the midwest was all the food festivals in the surrounding communities. I remember watermelon festivals, strawberry festivals and especially the corn festivals. Back then you could go to a festival and the kids could run all over the place without a worry, playing and eating until they could not hold another bite. 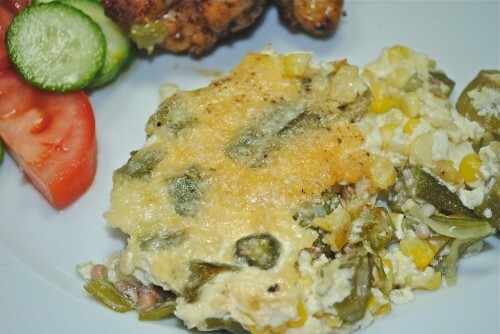 After a trip to Charleston a couple of years ago and seeing the Lee Brother’s Southern Cookbook everywhere, I decided to check it out from our local library and copied so many recipes onto my Mac Gourmet cookbook. I love having this computer cookbook because I can either type in recipes or import from websites and it so much better than the system I previously used. I made this recipe last summer and it is been hiding in my files just waiting to make it’s appearance. 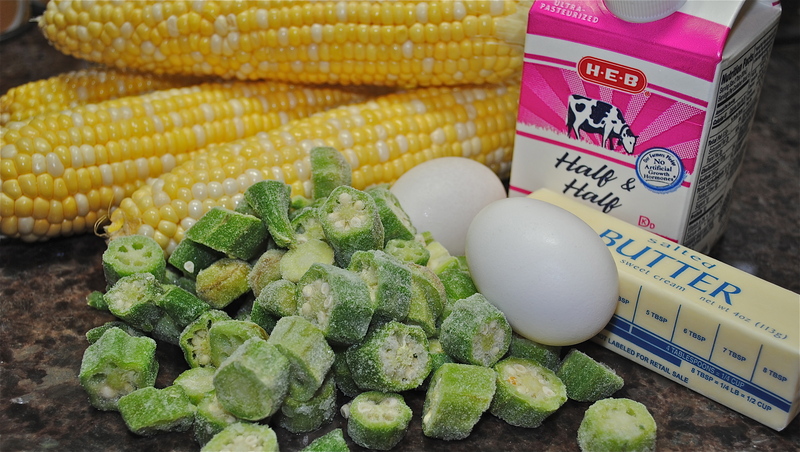 Corn and okra are two of my favorite vegetables and two of my favorite things to pick up at a farmer’s market. I have to admit that I did not buy fresh okra for this recipe but used frozen okra BECAUSE the fresh okra looked terrible in the grocery. It always has black streaks and just never looks fresh picked. I would rather have frozen okra than the spotted vegetable because I know it was picked and frozen at it’s peak. There are a few changes I will make in this recipe when doing it again; I will add a little sautéed onion and garlic and maybe some green chiles. A little cheese would also be a nice addition. I loved the creamy texture of this dish; almost a savory creme brûlée. Fresh cut corn, nothing better. I just had print this picture. I love the cold smoke coming off the frozen okra. 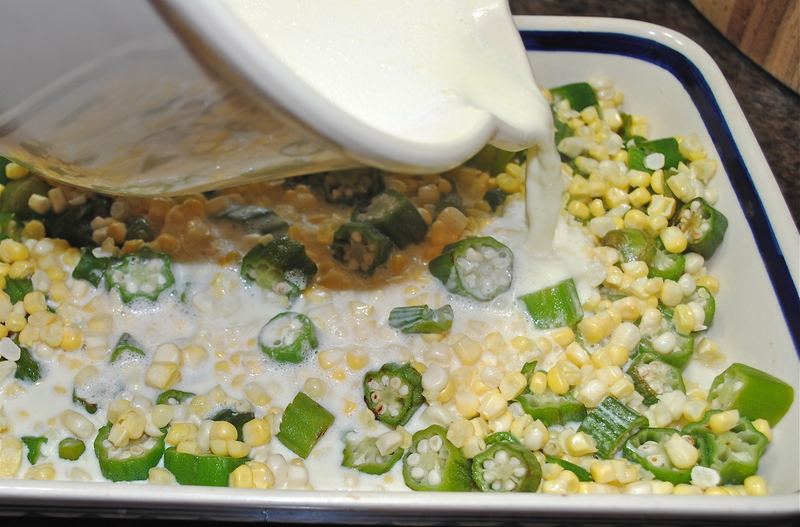 Pour the egg/cream mixture over the corn and okra. Couldn’t wait to dig in. Preheat oven to 350°. Grease a 1 quart baking dish with 1/2 tablespoon of the butter. 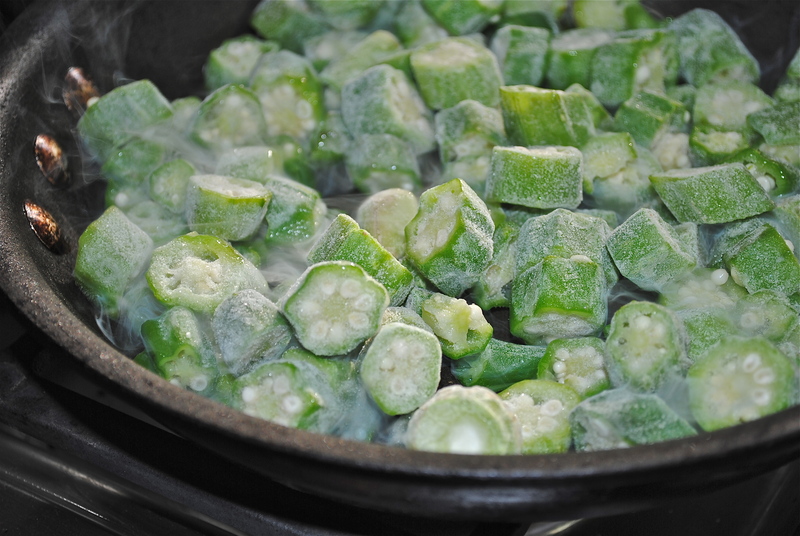 Scatter the okra in a single layer in a dry skillet or large sauté pan. Cook over medium high heat, move the pieces around the pan until the okra is just brown around the edges, about 8 minutes. Remove from the heat and reserve. Cut the remaining 2 tablespoons butter into pieces. In a small saucepan, heat the butter, half and half, salt and sugar over medium heat until the butter melts and the half and half just begins to simmer. 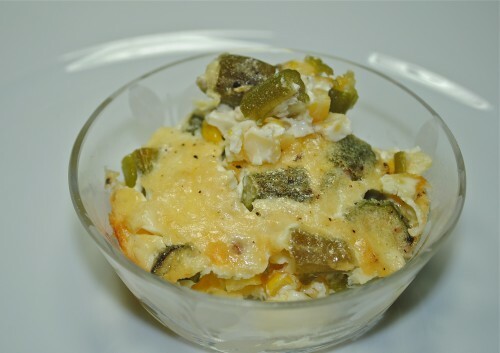 In a bowl, bedat the eggs with a whisk until they are lemon yellow. Pour the hot half and half mixture slowly into the eggs in a thin stream, whisking constantly. 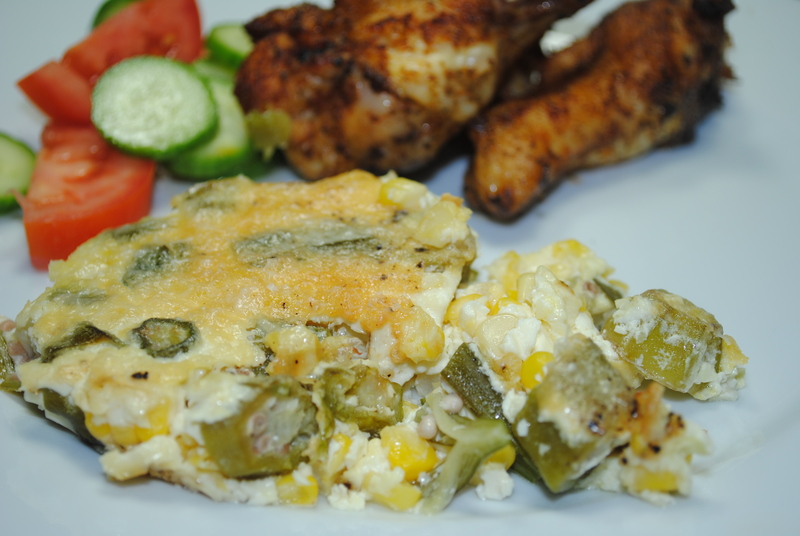 Place the okra and the corn evenly in the baking dish and pour the milk and egg mixture over them. Bake for 40 minutes or until a toothpick inserted in the center comes out clean. Cut in squares or scoop out to serve.